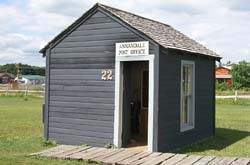 Many early communities, like Annandale, located their post office in the general store. However, in 1886, a small building like this was built. The shelves and mail slots here are from the Annandale and Clearwater post offices. They were being used to sort nuts and bolts in the basement of the hardware store until they were given for this display. The early post office was open only a few hours each day after the train had left the mail sack. It was considered a neighborly thing to pick up and deliver the mail that was addressed to anyone whose house would be passed going home since most farmers did not have many opportunities to get into town.